A Manatee County school is taking a heavy handed approach to school security. MANATEE COUNTY, Fla. — A Manatee County school is taking a heavy handed approach to school security. 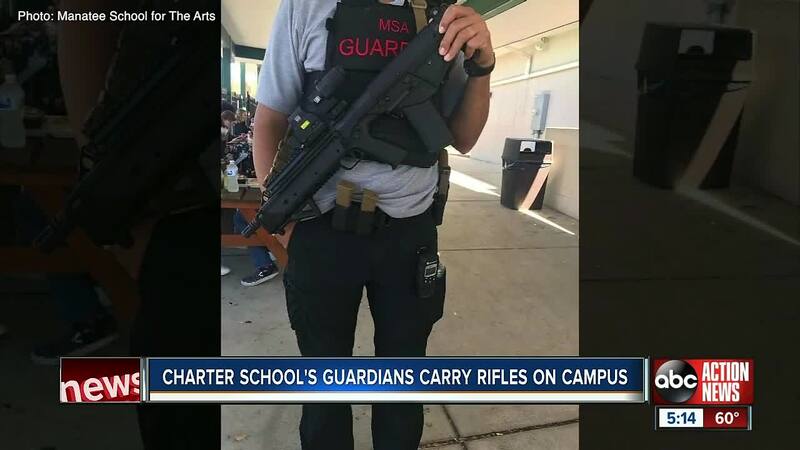 School guardian officers for Manatee School for the Arts are equipped with body armor and a semi-automatic rifle. "We aren’t trying to be big and bad, we just want to make sure if in the unlikely event, that something goes down, we have the right people with the right tools to get that job done,” said Principal Dr. Bill Jones. Jones said the sprawling campus needs to have adequate security. He said a handgun wouldn’t be effective against an active shooter. "If you’ve got one hundred-fifty feet that’s not an effective distance for a handgun, it’s a simple distance for something like the rifle our guardian uses,” said Jones. The decision to show military style force is drawing some criticism. Jones said the school is the only one in the state to equip its guardians with rifles. Palmetto Police Chief Scott Tyler said he was skeptical of the decision when he first heard about it, but changed his mind when he realized how much ground the guardian had to cover. “It’s not a bad approach, but there may other schools were it’s not really a good approach,” said Tyler. The Manatee County Public School District is not following the charter school’s approach. Guardians in the Manatee County School district carry handguns.